Jennifer Dawson was born in London in 1929. She attended school in Camberwell and went on to read Modern History at St Anne’s College, Oxford. In 1951, while at Oxford, she suffered a breakdown and was hospitalized for several months, an experience that helped inspire her first novel, The Ha-Ha (1961). She returned and took her degree in 1952, and afterwards worked for Oxford University Press. 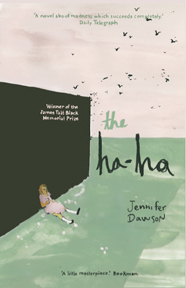 The Ha-Ha, published by Anthony Blond, was met with near-universal critical acclaim and won the James Tait Black Memorial Prize as the best work of fiction of 1961. The novel was also adapted for the stage and for radio. Her next book, Fowler’s Snare (1962), won the Cheltenham Festival Award, and Dawson went on to publish six further volumes of fiction over the next three decades, the final of which was Judasland (1989), which won the Fawcett Prize. Dawson was committed to the cause of nuclear disarmament and met her husband, Michael Hinton, an Oxford philosophy don, during the 1963 Aldermaston march. She remained active in the peace movement in the Oxfordshire village of Charlbury, where she lived the last twenty years of her life. Jennifer Dawson died in 2000. For more information, see the website created by Dawson's family: http://www.jenniferdawson-haha.com.